Is Austin ready for the future? As many of us here in Austin know, there is always a large variety of activities, events, and businesses coming in and out of the city. But is it really ready for what’s in store for the future? Well, based on the the 2015 Strategic Innovation Summit: Enabling Economies for the Future, hosted by Harvard University and sponsored by Dell, it looks like Austin is ready! 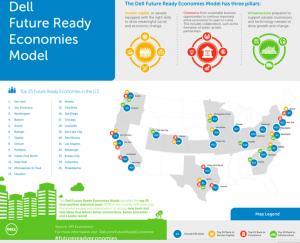 In fact, Austin made it to the top five list of future-ready cities, following San Jose, San Francisco, D.C., and Boston. Check out how this was measured and more here. If you are thinking about a move to Austin, we’re ready for you! You can also read more about Austin’s future in another article published in Forbes here.